Actress Hayley Magnus dances to her own beat in Diet Coke's Big Game spot. 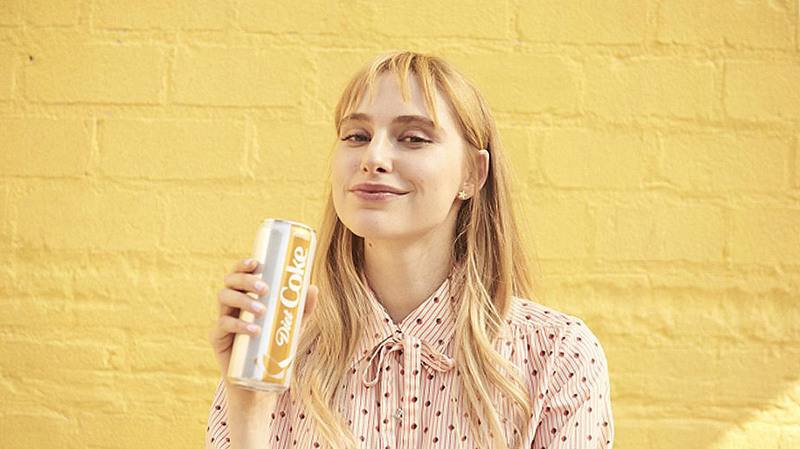 What happens when you crack open a can of one of Diet Coke’s new millennial-friendly flavors, ranging from Zesty Blood Orange to Twisted Mango? Semi-awkward, spontaneous dancing can occur, according to the brand’s 30-second Super Bowl LII ad from Anomaly. Up-and-coming actress Hayley Magnus (of The Dressmaker and Mojave) stars in the spot, “Groove.” Magnus stands in front of a lemon-colored wall, Diet Coke Twisted Mango in hand. When she takes a sip from the skinny, revamped can, things truly get twisted. The actress also stars in the Diet Coke Zesty Blood Orange “Spice of Life” spot that is part of the brand’s larger “Because I Can” campaign. That campaign launched earlier in the week with four 15-second spots (one for each new flavor) and a 30-second anthem spot starring actress Gillian Jacobs. While on set, shooting the “Because I Can” campaign, Magnus apparently went off script and started doing her own thing (what viewers will see in the final spot). Her bit of the campaign wasn’t intended to be the final Big Game ad, but when the Diet Coke team and director Paul Feig (of Bridesmaids and The Heat) saw Magnus in action, they knew they wanted to use that footage.